Obama's Legacy, a Nuclear Iran? May 24, 2017: On May 17, the Trump administration renewed a waiver of sanctions preventing U.S. companies from selling to or dealing with Iran, thus extending the Joint Comprehensive Plan of Action (JCPOA) that allows Iran to continue enriching uranium with restrictions. Days later, President Trump attacked Iran in unprecedented terms in a high-profile speech in Saudi Arabia. Though seemingly contradictory, the moves follow the advice offered weeks earlier in the below article by Emily B. Landau from the Spring 2017 issue of Middle East Quarterly. 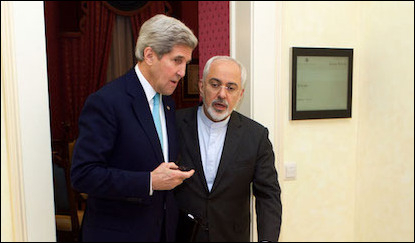 U.S. secretary of state John Kerry (L) and Iranian foreign minister Mohammad Javad Zarif confer informally during negotiations on the Iran nuclear deal. President Obama considers the July 2015 agreement to be his crowning foreign policy achievement, but the deal has many flaws and weaknesses. There is little doubt that Barack Obama deems the Joint Comprehensive Plan of Action (JCPOA) of July 2015 to be his crowning foreign policy achievement and an important pillar of his presidential legacy. To his mind, the deal is a shining nonproliferation success story achieved via peaceful diplomacy and an important catalyst to improving decades-long, moribund U.S.-Iranian relations. But, Obama's assessment is wrong. The JCPOA has many flaws and weaknesses, and it is important to assess the president's role in the process that produced this dubious deal: What happened on the ground; how Obama's perceptions of nuclear disarmament colored his attitudes toward Iran, and the tactics he used to marginalize criticism and mobilize support for a flawed deal at the domestic level. It is equally important to examine to what lengths the president went in order to protect his problematic deal after it was presented, and at what cost. What legacy on Iran has Obama left for the next administration? In early April 2009, shortly after entering the White House, Obama made his first major foreign policy speech in Prague where he unveiled his agenda for advancing the goal of global nuclear disarmament. While his initial steps in this direction were taken primarily at the global level, in autumn 2009—after Tehran had been caught red-handed constructing a hidden enrichment facility at Fordow—Obama made his first attempt to conclude a partial nuclear agreement with Iran in the context of a "fuel deal" offered by the five permanent members of the U.N. Security Council and Germany (P5+1). The offer was that 75-80 percent of Iran's then-stockpile of low enriched uranium would be shipped abroad and turned into the fuel plates that the Iranians said they needed to run the civilian Tehran Research Reactor. The offer was purposely designed to test whether Tehran was exclusively focused on civilian nuclear activities as it emphatically insisted—a claim the West did not believe and for which it demanded "proof" via Iranian action. Yet while Tehran rejected the deal and failed the U.S. test, the administration persisted in its efforts to engage the determined proliferator. Although Obama did move to ramp up sanctions significantly on Tehran in 2010 after the deal was rejected—a process that culminated with the biting sanctions of 2012—the bad faith displayed by Iran in the nuclear realm hardly resonated with an administration that was bent on diplomacy. The tendency to try to prove Tehran's intransigence, only to continue the talks after such proof was provided—including agreeing to more concessions—is a dynamic that was also to reappear in later stages of the negotiations. Maintaining diplomacy, which began as a means to an end (i.e., stopping Iran's quest for nuclear weapons), gradually became an end in itself. This provided an important lesson for Tehran when negotiations began in earnest in 2013. After securing an interim deal, or Joint Plan of Action (JPOA), in late November 2013, negotiations on a final and comprehensive nuclear deal began in January 2014. Up until 2013, the P5+1 had sought to dismantle Iran's nuclear infrastructure—except perhaps for an extremely limited and mainly symbolic enrichment program of no more than 1,500 centrifuges—and to deny it the ability to develop nuclear weapons. However, by 2014, the P5+1 negotiators had deemed this goal unattainable and settled instead for the much watered-down aim: merely lengthening Tehran's breakout time from several months to a year while leaving much of its nuclear infrastructure intact. Many of the P5+1's red-lines regarding the dismantlement of Iran's nuclear infrastructure disappeared altogether. Moreover, they agreed to lift the restrictions in ten to fifteen years regardless of any change in Iran's interests or behavior. Initial concessions, such as agreeing not to discuss ballistic missiles, opened the door to further compromises, all in an effort to keep Tehran at the negotiating table. The red-lines regarding the dismantlement of Iran's nuclear infrastructure turned pink, and many disappeared altogether. This included the number of centrifuges left spinning (originally 1,500, then 4,000, finally 6,000). Furthermore, the centrifuges were not dismantled but rather mothballed; the Fordow facility was left running; research and development was enabled into a full range of advanced centrifuges; and the demand for inspections of suspicious activities "any place, any time" turned into a much longer and ambiguous process. Indeed, the hard-gained leverage of the biting sanctions that brought the Iranians to the table was gradually squandered in a process where Washington projected greater eagerness for a deal than Tehran. What's in the JCPOA Deal? With the July 2015 JCPOA, Obama proudly claimed to have severed every pathway to Iranian nuclear weapons, thus preventing Tehran from obtaining such capability. He further emphasized that the International Atomic Energy Agency (IAEA) would have access to any suspicious facility "where necessary, when necessary." But a closer examination of the nuclear deal reveals that it does not uphold these sweeping assertions. Rather, the agreement contains major concessions that undermine the deal's effectiveness as well as including ambiguities that will no doubt be abused by Tehran to advance its nuclear program. Briefly, the major weaknesses and flaws of the deal, both technical and political, include the following issues. Tehran can continue its uranium enrichment operations while perfecting its techniques and doing away with excess amounts. Iran's uranium enrichment program. Not only did the JCPOA depart from the goal of eliminating Tehran's enrichment program—leaving it with 6,000 centrifuges—but it actually legitimized the program by allowing continued enrichment under the terms of the deal. The agreement stipulates that Iran's stockpile of low enriched uranium must not exceed 300 kg, but Tehran can continue its enrichment operations while perfecting its techniques and doing away with excess amounts. Moreover, the deal enables Iran to continue research and development on an entire range of advanced generations of centrifuges, which will be far more efficient than its current IR-1 centrifuges and which Tehran plans to begin operating by the thousands from year eleven of the deal. Inspections and verification. According to the Nuclear Non-proliferation Treaty (NPT), the IAEA is allowed access only to declared nuclear sites but has no inspection rights at military facilities. In Iran's case, this meant that inspectors could not demand entry to Parchin where Tehran was carrying out its illegal military nuclear activities. By way of closing this loophole, the JCPOA was meant to ensure "any time, any place" inspection rights for the IAEA. According to one reading, the JCPOA ensures that Tehran will have to agree to a requested inspection at a suspicious military facility within 24 days of notification. Given Tehran's continued insistence that it will never allow entry to its military facilities, any demand for inspection is bound to spark a major confrontation. In reality, however, the deal fails to secure timely access despite Obama's claim to the contrary. According to one reading, the JCPOA ensures that Tehran will have to agree to a requested inspection at a suspicious military facility within twenty-four days (which in some cases could be too long a wait for the inspectors). But looking more carefully at the wording in relevant sections reveals that Tehran can use different excuses to prolong that timeline before the 24-day clock even begins ticking. In light of Tehran's continued insistence that it will never allow entry to its military facilities, any demand for inspection is bound to spark a major confrontation. The regime can be expected to do everything within its power to delay and bar entry, building on the ambiguity in the JCPOA text. An additional problem relates to possible military work conducted at a facility outside Iran with North Korea being the most obvious suspect. Cooperation between Tehran and Pyongyang in the non-conventional realms, including the nuclear sphere, has been tracked for years. It would make perfect strategic sense for Iran to try to outsource some of its nuclear activities to North Korea, and it is not clear how closely this issue is being monitored. Pyongyang's work on intercontinental ballistic missiles (ICBM) is also of great concern. Any in-formation would have to rely on state intelligence as North Korea abandoned the NPT in 2003. Iran's past military work. The entire case for confronting Tehran's nuclear ambitions hinges on its persistent violation of the NPT—both the safeguard agreements with the IAEA when it failed to notify the agency about nuclear facilities under construction at Natanz, Arak, and later Fordow, and, more significantly, its work on a military nuclear program. But the negotiations curiously did not include clarification of lingering questions about the "possible military dimensions" (PMD) of Iran's program; in fact, the P5+1 instructed the IAEA investigation in this regard to be carried out in the months after the JCPOA was announced. 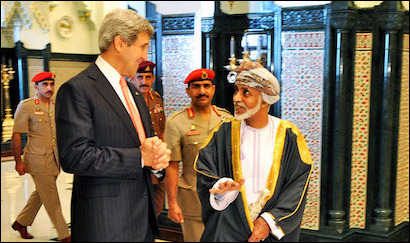 U.S. secretary of state Kerry speaks with Omani sultan Qaboos bin Said al-Said (R), May 21, 2013. The U.S.-Iran thaw may have begun with secret meetings in Oman between U.S. and Iranian officials. In early December 2015, despite Tehran's continued lack of cooperation, the IAEA published the results of its investigation confirming that the Iranians had worked on a military program until 2003 and, in a less coordinated manner, until at least 2009. But in response, the P5+1 shelved the report and moved to implementation day. These states never pushed back against Tehran's claim of "nuclear innocence" (i.e., that it has never worked on a military nuclear program), which it maintains to date. Continued international acquiescence in this blatant falsehood gave rise to suspicions that this could have been pre-agreed to with Tehran, possibly even in the context of the secret U.S.-Iranian negotiations in Oman in 2013 though there is no hard evidence of such an understanding. What is clear, however, is that Tehran's narrative of innocence is anything but innocent; rather it has been a commonly used Iranian ploy to reinforce its claim to have been unjustly singled out for "illegal" sanctions and to demand that it be treated as a "normal" member of the NPT, including the right to confidentiality in its dealings with the IAEA. Dealing with a future violation. The JCPOA lacks decision-making guidance for dealing with Iranian violations beyond mention of the so-called "snapback sanctions." What kind of violations would be significant enough to elicit such a response, and what are the criteria for their determination? Who must agree and in what timeframe? What should be done, and who will do it? These are all questions that will take time to answer and agree upon; failing to address them in advance risks granting Iran valuable time to race to breakout. On the snapback sanctions, to state the obvious, they do not snap back on their own but rather are reinstated by states, which must decide which sanctions will be reinstated and under which conditions. All these issues require further deliberation and decisions, and there is no indication that they have been tackled. Sunset provisions. Perhaps the most problematic aspect of the JCPOA are the sunset provisions, whereby restrictions on Iran will be lifted in ten to fifteen years regardless of Tehran's behavior or demonstrated regional and nuclear ambitions and interests. Without indication of a strategic U-turn in its nuclear outlook, there is no reason to assume that in ten to fifteen years Tehran will not go back to doing precisely what it was doing before the deal was reached. Moreover, it will be doing so from a far more advantageous starting point after having built up an industrial-sized enrichment program. It is important to note that the counterargument whereby many arms control agreements, such as those between the United States and Russia, have termination dates is irrelevant to the JCPOA for the simple reason that it is not a political arrangement between two nuclear powers but rather an agreement between an NPT violator, Iran, and the international com-munity aimed at bringing it back to the fold of the treaty. Until the violator indicates that it has altered its nuclear ambitions, there is no justification for sunset. The sunset provision is another instance which high-lights why Tehran insists on its narrative of nuclear innocence: It helped justify the Iranian demand for an unconditional expiration date. If Tehran's proven past record of violating the NPT had been at the forefront of the debate, it would have been obvious why the JCPOA could not reasonably be terminated without the Iranians meeting certain benchmarks. From the start, and flowing from Obama's nuclear disarmament agenda, the rationale and strategy for dealing with Iran's nuclear ambitions were ill-conceived. To begin, Obama believed that the great powers must come with "clean hands" when confronting Tehran, thus linking the goal of stopping determined proliferators to global disarmament. But this link is misguided, not least because Iran's pursuit of nuclear weapons was a blatant violation of the NPT whereas the treaty sets no deadline for nuclear states' disarmament. Moreover, Tehran was pursuing its own nuclear goals, and these were not at all connected to whether the nuclear powers were disarming or not. But Obama's belief that Washington was on shaky moral ground vis-à-vis Tehran at least partially explains his overly lenient attitude on some key issues, such as conceding to Iran's demand not to include ballistic missiles in the nuclear negotiations and insisting on not publicly "shaming" Tehran by emphasizing its deceitful past behavior in the nuclear realm. Nor was the close connection between Tehran's nuclear aspirations and its regional ambitions well-integrated into Obama's thinking and policy. And while there were good reasons for not attempting a "grand bargain" with Iran encompassing a wide range of issues, which would have undoubtedly complicated and prolonged the negotiations, it was a mistake to think that the nuclear issue could be neatly separated from other aspects of Iranian behavior. Ironically, Obama implicitly validated this linkage by implying that the nuclear deal could lead to a more moderate Iran and improved bilateral relations. What he refused to accept, however, is the flip side. Namely, that absent such a change, the intimate connection between Tehran's military nuclear ambitions and its overall hegemonic aspirations could not be ignored and should have led Washington to resist firmly any sunset provisions before a strategic U-turn could be discerned. Otherwise, the most that could be achieved—in the best-case scenario—is a delay in Iran's plans after which it could pick up where it left off. Obama wanted a deal with Iran, and it seemed that he willed it at almost any cost. Complicating matters considerably was Obama's desire to mend fences with all U.S. enemies, a theme he set forth in his inaugural speech in 2009: the famous "outstretched hand" in return for the "unclenched fist." The president wanted a deal with Iran, and in the latter stages, it seemed that he willed it at almost any cost. He appeared unwilling to give up this goal, which brought together the twin aims of rolling back nuclear capabilities and befriending a major enemy of the United States. Some have suggested an even more far-reaching strategic aim that guided Obama's dealings with Tehran from the start: the desire to fundamentally restructure U.S. relations with the Middle East in a manner that would place Iran, rather than traditional U.S. allies, at the core of the new regional architecture. Given that Obama wanted a nuclear deal—seemingly at almost every cost—it is hardly surprising that the heavy-handed manner by which his administration promoted the JCPOA and delegitimized any and all criticism of its substance has become an integral part of his legacy. In the early stages of the negotiations, Obama had frequently reiterated the maxim that "no deal is better than a bad deal" in an attempt to reassure skeptics that he would not accept an unsatisfactory arrangement. Al-though he resisted defining what would constitute a bad deal, it was believed that he was adamant about not being out-maneuvered by Tehran. But as he began to demonstrate an increasingly firm commitment to achieving a negotiated agreement, it seemed that this slogan was being replaced by another, whereby "almost any deal would be better than no deal." This was about the same time that the administration began stressing to the American public that the only alternative to the emerging deal—which clearly failed to fulfill the original nonproliferation goals set by the ad-ministration itself—was war. The choice between the deal and war was never an accurate depiction of reality: It was a political argument. By misrepresenting the choice between the JCPOA and war as a statement of fact, the administration sought to depict anyone who voiced reservations or criticism of the deal as a warmonger, which is how critics were regularly labeled. But the choice between diplomacy and war was never an accurate depiction of reality: It was a political argument. In fact, what many, if not most of the critics were advocating—in the months leading up to the deal—was not to end negotiations and resort to other means but rather to use the economic leverage more wisely in order to get a better deal at the negotiating table. Washington would have done well to call Tehran's bluff when it threatened to leave the talks because the Iranians would not have left for long. Indeed, the only way to get sanctions lifted—which is what brought Tehran to the negotiating table in the first place—was to continue negotiating. Moreover, Washington's demonstrated eagerness for a deal was clearly undermining its leverage. Had more sophisticated bargaining techniques been employed, a better deal could most likely have been achieved. But by turning critics into despicable hawks itching for a war, the message was that their advice should be ignored altogether. The administration used other tactics to silence critics. It falsely claimed that opponents had no idea what was going on in the negotiating room, hence, had to await the conclusion of the deal in order to be familiarized with its actual details. However, there were media reports along the way that reflected much of what transpired in the negotiations—especially regarding the concessions being made to Iran. When the JCPOA was announced, it was clear that the reports had been accurate. But the minute the JCPOA was announced, critics were told that their criticism had been rendered irrelevant because it was a done deal. This manipulative messaging policy obviously left no room for voicing legitimate and potentially useful critique of the negotiations and the nascent deal—it was either too early or too late. In selling the deal to the American public, the administration pushed additional political positions as statements of fact. A good example is the claim that there was no risk in giving the deal a chance since even if Tehran were to violate it, or to wait it out, Washington would always have the same options (i.e., military force) that it had had when negotiations began. But this is not necessarily true, and the statement reflects a poor understanding of international politics where options and opportunities can easily change over time. Even today, one can see how Russia's increased and active role in the Middle East, cooperating closely with Iran in the military campaign in Syria, can greatly complicate the calculus of a military strike against Tehran down the line, as compared to previous years. In future years, such a strike could risk escalation not only with Iran, but with Russia as well. By 2015, there was an accelerated campaign to suppress and squelch any criticism that might have led to a better deal, and the "echo chamber" that was devised for this purpose was later described by none other than Ben Rhodes, Obama's deputy national security adviser for strategic communications, during in-depth interviews with The New York Times. Lawmakers such as Sen. Robert Menendez (Dem., N.J.)—a long-time, outspoken critic of the negotiations and deal—were directly derided by the administration for their critique. The echo chamber tactics were particularly intense during the summer 2015 congressional debate on the JCPOA, which together with the special voting procedure set by the administration, resulted in the deal not being toppled by Congress. 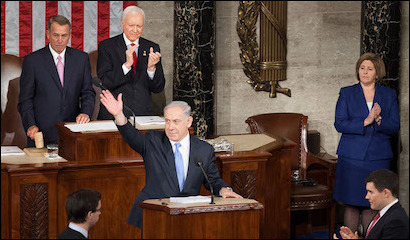 Prime Minister Binyamin Netanyahu (center) addresses a joint session of Congress, Washington, D.C., March 3, 2015. He has criticized the Iranian nuclear deal, warning that it will not prevent Tehran from gaining nuclear weapons capability, which poses an existential threat to Israel. Israel's objection to the deal—voiced loudly and clearly by Israeli prime minister Binyamin Netanyahu—presented a particular challenge for Obama, resulting in great effort to frame the prime minister as the odd man out on the issue. He was depicted as an unwavering rejectionist to any deal with Iran and as out of step with the international community. When Netanyahu persisted in his criticism, culminating in his controversial speech to Congress in March 2015, his relations with Obama almost reached a boiling point, and all bets were off as far as the administration was concerned. One new tactic was to delve into the internal Israeli scene and to frame Netanyahu not only as the odd man out vis-à-vis the world but also with Israel's defense establishment, which the Obama administration claimed actually supported the deal. In contrast to Netanyahu's speech—which was politically problematic and which many considered unwise but accurate in its content—the administration's claim was spurious and unfounded. The actual range of opinion voiced in Israel was much more varied and nuanced, necessitating more sophisticated analysis, but it never amounted to "Netanyahu vs. the defense/security establishment" regarding assessments of the negotiations, and certainly not with regard to the merits of the deal itself. As misconceived and problematic as the JCPOA is, developments in the first year of its implementation have rendered the situation even worse. This is reflected in a string of revelations about additional concessions made to Tehran as well as the particular manner in which U.S.-Iranian interactions have unfolded over this period. Deception and distortion revealed. Part of Obama's legacy regarding the Iran nuclear deal is no doubt the deception and distortion, revealed in 2016, which the administration employed about certain aspects of the JCPOA and related events. Two issues in particular deserve mention: Tehran's enrichment plans from the eleventh year of the deal, and the $1.7 billion paid to it, ostensibly to settle a pre-Islamic Revolution debt from the days of Shah Mohammad Reza Pahlavi. Tehran plans to begin operating advanced generation centrifuges, many times more efficient than the centrifuges currently in use. Information with regard to Iran's enrichment plans for year eleven was first published by Associated Press (AP) in July 2016, which revealed that Tehran plans to install and begin operating 2,500-3,500 advanced generation centrifuges that will be many times more efficient than the IR-1 centrifuges currently in use. This development would shorten the time required to produce enough weapons-grade uranium for one nuclear weapon to six months. This information was hidden from public view when the deal was presented and in the subsequent congressional debate and revealed only a year later. Worse, this lack of transparency was thereafter explained by the common practice among NPT member states to conclude confidential arrangements with the IAEA, ignoring the fact that as an NPT violator, there was no justification for granting Iran privileges enjoyed by NPT members in good standing. Moreover, the AP revelation was a reminder of an interview granted by Obama to NPR in April 2015, in which, when referring to the emerging deal, he noted that "a more relevant fear [than hoarding uranium] would be that in year 13, 14, 15, [Iran has] advanced centrifuges that enrich uranium fairly rapidly, and at that point the breakout times would have shrunk almost down to zero." This statement sparked immediate attention because it confirmed the fears that critics had been voicing about Tehran's ability in the not too distant future to rush quickly to develop a nuclear bomb. But in a press conference, then-acting spokesperson for the State Department, Marie Harf, flatly denied the implication, claiming instead that Obama was referring to the scenario of no deal. However, the president's interview had been filmed, and it was obvious that he alluded to the scenario of a deal. The information on Iran's enrichment plans that was finally revealed in July 2016 is clearly the basis for Obama's earlier statement and assessment, underlining the secrecy, deception and distortion that characterized this episode. The Wall Street Journal revealed that there was a clear linkage between the release of four American prisoners held in Iran and the return of money to Iran originally paid by the shah for an arms deal with the United States, which was aborted after the Islamic Revolution. Both actions came close on the heels of the nuclear deal. The money transfer episode of January 2016 offered a similarly disturbing illustration of the administration's deceptive conduct. The original story was that the JCPOA's implementation day was followed by two parallel and unrelated events: the release of four (but not all) American prisoners held in Iran on bogus charges and the return of money paid by the shah for an arms deal that was aborted after the Islamic Revolution. The Wall Street Journal revealed that there not only was a clear linkage between the two events but that the $400 million transferred in January had been paid in hard cash in line with Tehran's demand, leading many to conclude that the administration had in effect paid Tehran ransom for releasing the prisoners, in contravention of long-standing U.S. policy. No pushback against Iran's provocations. Since the JCPOA was adopted, Tehran has been testing the international community's readiness to respond to provocations. Iranian supreme leader Ali Khamene'i has been clear about rejecting any form of cooperation with the United States, and during 2016, Washington was repeatedly (and falsely) accused of not upholding its end of the deal. Obama agreed to Tehran's demand not to include ballistic missiles in the nuclear negotiations. 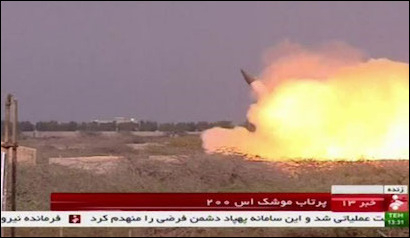 After the deal was completed, Iran tested precision-guided ballistic missiles capable of carrying nuclear payloads in violation of U.N. Security Council resolutions. Other Iranian provocations included testing precision-guided ballistic missiles capable of carrying a nuclear payload in violation of U.N. Security Council resolutions, and stepping up military intervention in Syria—in cooperation with Russia—with the aim of keeping Bashar al-Assad in power. All indications are that rather than the nuclear deal promoting Iranian moderation and opening the door to new opportunities for cooperation, Washington and Tehran are still engaged in a fierce struggle, at least as far as the Iranians are concerned. Security, noted that for the second time, Tehran had exceeded the limit of heavy water production and was con-ducting activities related to IR-6 advanced centrifuges, which may not be allowed by the JCPOA. Since then, it has been reported that Iran is also set to begin injecting gas into IR-8 centrifuges, meaning they are beginning to test them, on the way to making them operational. These Iranian actions have been matched by Washington's lack of response. Indeed, in every instance, the administration rushed to provide reassurances that whatever transpired was of no real consequence and that there was no reason for concern. This whitewashing even extended to German intelligence released in 2016 indicating that, throughout 2015, Tehran had continued attempts to illicitly procure technologies and components that could be used in a nuclear weapons program. The administration's thinking in all of these cases seemed to have been that it could not risk upsetting Tehran in any way because this might cause the Iranians to abort the deal. But Iran most likely would not have left the JCPOA since the deal is not unfavorable from its point of view. The result of Obama's bending over backward has been a dangerous shift in the balance of deterrence between the two states in Tehran's favor, leaving the Trump administration with the daunting task of regaining the upper hand in dealing with Iran and reassuming lost leadership, authority, and power. Obama leaves the Middle East a far more dangerous place than it was eight years ago. Having orchestrated a deeply flawed nuclear deal, Obama leaves the Middle East a far more dangerous place than it was eight years ago. Not merely because the JCPOA opens the door to the terrifying prospect of a nuclear Iran within ten to fifteen years, and perhaps even sooner, but because the administration enabled an emboldened Iran to emerge over the course of 2015-16, unchallenged by Washington. In fact, while negotiating the deal, the U.S. president was already helping to transform the Islamic Republic, with its extremist, hegemonic agenda, into the region's preeminent power at the expense of traditional U.S. allies. For example, despite Obama's pretense to be focused exclusively on the nuclear issue by way of securing the JCPOA, Jay Solomon of The Wall Street Journal argues that the president resisted upholding the redline he had set with regard to Assad's use of chemical weapons due to a warning issued by Tehran: If the U.S. resorted to military force in Syria, it could scuttle the nuclear negotiations. Obama continued to shun the Syrian crisis to his final days in office so as not to upset Tehran and risk rattling the nascent nuclear deal. According to this interpretation of events, Washington left Syria to Iran (and Russia) in return for the nuclear deal, a tradeoff that the administration denies. Sadly, the American public remained largely oblivious to these blunders as the administration's echo chamber strategy proved extremely effective with most pundits—except a few very notable exceptions—expressing unmitigated support for the JCPOA in line with administration talking points and positions. The arms control and nonproliferation community, which should have been at the forefront of the debate, pointing out all the deal's weaknesses and potential pitfalls, was in the main uncritically lured by the administration's propaganda. On a broader level, Obama's heavy-handed delegitimization of any and all criticism and his aggressive pushing of the deal in Congress have left domestic political scars, including among Democrats, that add to the president's dismal Iranian legacy. Obama's only achievement lies in kicking the nuclear can down the road to future administrations. But he created a reality in which it will be far more difficult to stop Iran down that road. With its nuclear program legitimized by the JCPOA, Tehran is much better poised to forge ahead at a time of its choosing. For contrary to Obama's emphatic statements, the JCPOA does not end Tehran's nuclear ambitions, nor has it lived up to the president's hope of ushering in a new era in U.S.-Iranian relations. The challenge for the Trump administration is to try to reverse some of these negative trends. In making the best of a bad situation, the preferred route at this point—after Tehran has already pocketed billions of dollars—would be neither to renounce the deal nor try to renegotiate it but, rather, to enforce it strictly as well as strengthen its provisions. Much can be achieved by reversing the Obama administration's approach to Iran—recognizing Tehran's overt hostility to U.S. interests and responding with firm determination to its provocations beyond the direct context of the JCPOA. These, however, are but general guidelines for future U.S. policy on this issue. After the damage wrought by the Obama administration, the road ahead will be strewn with difficulties, and there are no shortcuts or magic solutions for redressing the situation. Emily B. Landau is a senior research fellow at The Institute for National Security Studies (INSS) in Tel Aviv and head of its arms control and regional security program. "Remarks by President Barack Obama in Prague as Delivered," White House, Office of the Press Secretary, Apr. 5 2009. This followed in the footsteps of Henry Kissinger, George Shultz, William Perry, and Sam Nunn—the four high-level U.S. statesmen who together penned two extremely influential op-eds in January of 2007 and 2008, advocating the need to work toward a nuclear-free world. Emily B. Landau, "Obama's Nuclear Disarmament Agenda: Blurred Aims and Priorities," in Emily B. Landau and Tamar Malz-Ginzburg, eds., The Obama Vision and Nuclear Disarmament, INSS Memo. 107, Mar. 2011, pp. 15-26. The New York Times, Sept. 25, 2009. "Sanctions against Iran: A Guide to Targets, Terms, and Timetables," Belfer Center, Harvard Kennedy School, Cambridge, Mass., June 2015. See Emily B. Landau, "Principles and Guidelines for a Comprehensive Deal with Iran," in Emily B. Landau and Anat Kurz, eds., The Interim Deal on the Iranian Nuclear Program: Toward a Comprehensive Solution? Memo. no. 142 (Tel Aviv: INSS, Sept. 2014), pp. 11-5. "Statement by the President on Iran," White House, Office of the Press Secretary, July 14, 2015. For fuller analysis of these deficiencies, see previous writings, including Emily B. Landau, "Dangerous Ambiguity," The Jerusalem Report, Aug. 24, 2015. "AP Exclusive: Document Shows Less Limits on Iran Nuke Works," Associated Press, July 18, 2016. "Annex 1-Nuclear Related Measures," Q: "Access," p. 23, para. 75-6. For a further explanation, see Emily B. Landau, "What 29 Top US Scientists Don't Know," Times of Israel (Jerusalem), Aug. 10, 2015. The Times of Israel, May 20, 2015; Los Angeles Times, July 23, 2015. Alon Levkowitz, "North Korea and the Middle East," Mideast Security and Policy Studies no. 127, The Begin-Sadat Center for Strategic Studies (BESA), Bar-Ilan University, Ramat Gan, Jan. 10, 2017. Claudia Rosett, "The Audacity of Silence on Possible Iran-North Korea Nuclear Ties," Forbes, Dec. 15, 2016. 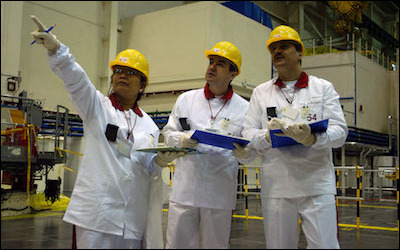 "Final Assessment on Past and Present Outstanding Issues Regarding Iran's Nuclear Programme," International Atomic Energy Agency, New York, GOV/2015/68, Dec. 2, 2015; David Albright, Andrea Stricker, and Serena Kelleher-Vergantini, "Analysis of the IAEA's Report on the Possible Military Dimensions of Iran's Nuclear Program," Institute for Science and International Security, Washington, D.C., Dec. 8, 2015. The Wall Street Journal, June 28, 2015; Los Angeles Times, Nov. 24, 2013. "Remarks by the President at the New Economic School Graduation," Moscow, Office of the Press Secretary, July 7, 2009; "Executive Summary," Nuclear Posture Review Report (Washington: D.C.: U.S. Dept. of Defense, Apr. 2010). See, for example, Meir Javedanfar, "The Grand Bargain with Tehran," The Guardian (London), Mar. 3, 2009. "President Barack Obama's Inaugural Address," White House, Office of the Press Secretary, Jan. 20, 2009. See, for example, Michael Doran, "Obama's Secret Iran Strategy," Mosaic, Feb. 2, 2015. The Guardian, Aug. 5, 2015. David Samuels, "The Aspiring Novelist Who Became Obama's Foreign-Policy Guru," The New York Times Magazine, May 5, 2016; David Samuels, "Through the Looking Glass with Ben Rhodes," The New York Times Magazine, May 13, 2016. Algemeiner (New York), Jan. 16, 2015. "Netanyahu's Full Speech to Congress," The Times of Israel (Jerusalem), Mar. 3, 2015. Times of Israel, Feb. 24, 2016, Aug. 5, 2016. For an example of a former defense official's position, see Moshe Ya'alon, "Why Iran Is More Dangerous than Islamic State," Los Angeles Times, Sept. 29, 2016. "Less Limits on Iran Nuke Works,", July 18, 2016. President Obama, interview, National Public Radio, Apr. 7, 2015. The Times of Israel, Apr. 7, 2015. The Wall Street Journal, Aug. 3, Sept. 6, 2016. OilPrice.com (London), Aug. 2, 2016; The New York Times, Sept. 21, 2016. David Albright and Andrea Stricker, "Analysis of the IAEA's Fourth Iran Deal Report: Time of Change," Institute for Science and International Security, Washington, D.C., Nov. 15, 2016. The Times of Israel, Dec. 21, 2016; Tasnim News Agency (Tehran), Dec. 19, 2016. Reuters, July 18, 2016; The Washington Free Beacon (D.C.), July 8, 2016. Jay Solomon, The Iran Wars (New York: Random House, 2016), pp. 229-33; Tony Badran, "Obama's Syria Policy Striptease," Tablet Magazine (New York), Sept. 21, 2016. Related Topics: Iran, US policy | Spring 2017 MEQ receive the latest by email: subscribe to the free mef mailing list This text may be reposted or forwarded so long as it is presented as an integral whole with complete and accurate information provided about its author, date, place of publication, and original URL.